Unless Martyrs of Korlis is tapped, any damage done to you by artifacts is instead applied to Martyrs of Korlis. You may not take this damage yourself, though you may prevent it if possible. No more than one Bodyguard of your choice can take damage for you in this manner. 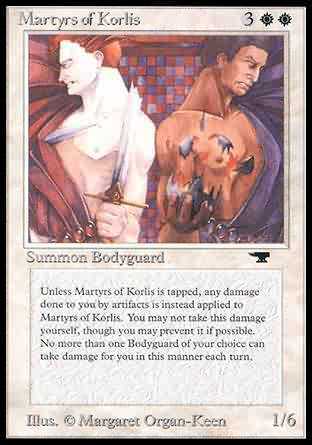 As long as Martyrs of Korlis is untapped, all damage that would be dealt to you by artifacts is dealt to Martyrs of Korlis instead.